In the weeks that have followed the PlayStation All Stars Battle Royale reveal, we’ve been asking you all to stay tuned for more exciting announcements. Well it’s finally time to deliver! We’re very pleased to announce that in addition to coming to the PS3, PlayStation All Stars Battle Royale will also be available on the PS Vita with full Cross Play support! Equally exciting is that Nathan Drake of the famed UNCHARTED series and Big Daddy from the amazing Bioshock universe join us as the latest additions to the PlayStation All Stars roster! The pick-up and play nature of PlayStation All Stars and the portable power of the PS Vita seem to be made for each other, so bringing the two together was a no-brainer. With Cross Play support, owners of the PS3 and PS Vita versions will be able to play against each other seamlessly, via both local and online play. 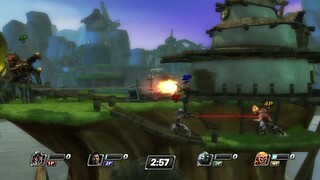 Both versions of the game feature identical gameplay at a blazing-fast 60 frames-per-second, offering the complete PlayStation All-Stars experience. 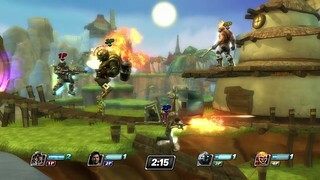 PlayStation All- Stars PS Vita takes advantage of many of the unique Vita features, including “near” functionality and both front touchscreen and rear touchpad support. 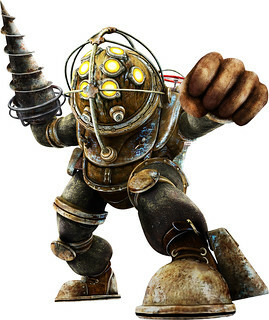 Equally exciting of course is the announcement of two new characters: UNCHARTED’s Nathan Drake and BioShock’s Big Daddy. 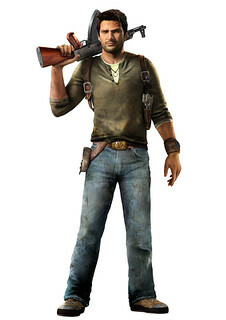 Nathan Drake is a true PlayStation star known to never miss an opportunity for adventure, making him a perfect addition to our roster. 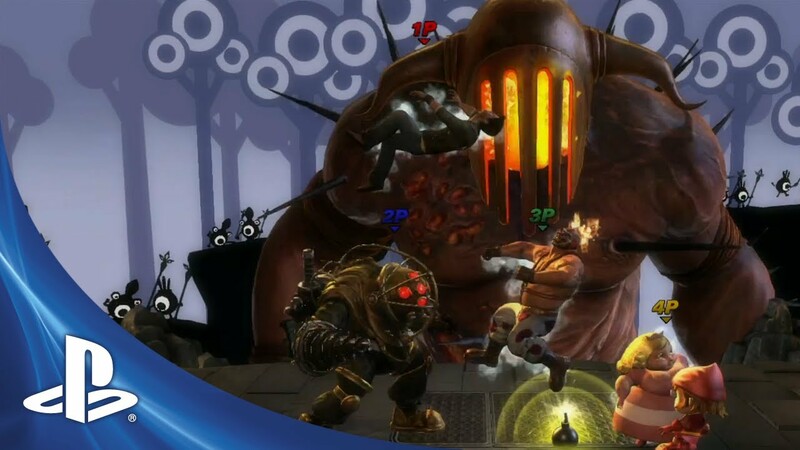 Big Daddy’s introduction may come as a surprise, but we think he’s a character that typifies the celebration that is PlayStation All-Stars. This deep sea giant packs a serious punch when he’s angry, offering a fun play style that’s fresh and exciting. E3 week is always an exciting time, and we’re really excited to be sharing this news with you all. If you make it out to E3, be sure to stop by the Sony booth to check out PlayStation All-Stars Battle Royale Vita featuring Cross Play, as well as our two new characters, Nathan Drake and Big Daddy. And of course, stay tuned for more feature announcements leading up to PlayStation All Star’s release this Holiday season. Put up the E3 demo of the game on PSN store right now!!! w00t! Big Daddy is coming to the party. Now, all we need is a Prinny, dood! Why you announced this on Facebook the day before E3 boggles my mind. I mean, really? But where is our PS+ list for June??? I know you guys are busy with E3 and all, but I’m eager to know after the tease on the E3 stage. GahIi was excited too..so basically nothing new for the Vita besides hulu and crackle? We already knew about everything else. @5 I too feel underwhelmed about the Vita showing. I dont see how they are going to sell 11million projected Vitas worldwide this year. There must be a lot of games that are going to be announced in the ensuing months. Hey, just a reminder: remove Nintendo Super Smash Bros from the tags in youtube for this video. Nice work on stage, Omar! Alot of characters I’ll like to see… but the Big Daddy & Nate role call made my day! Me and the Voltron Crew are going to have some fun with this game. Another reminded to remove the Super Smash Bros from the tags on the video. Unless you’re getting some money off ads or something based on the hits. Then go for it. People are not happy~ I could care less about it myself. I like the additions of Drake and Big daddy. Hopefully we will see more to come. And the game looks great, but I was underwhelmed with it’s E3 showing. All stuff we had seen before. And then we only got 2 character reveals at the end of it. awesome reveals, any chance alternate outfits will be available?, because drake’s desert outfit would be nice, also why only two reveals?, expected to see more, well i hope Cloud and Cole Mcgrath are the next revealed characters and there will be more stages? because i don’t see any new one. I like how you guys used Justice’s “Genesis” for this trailer, the music makes the gameplay trailer even better. CMON GUYS LETS GET PRINNY IN THIS!! No disrespect Omar but you guys already know that everyone wants Square Enix characters such as Cloud, Sephiroth, Lightning and Sora! For the love of Playstation, get rid of the Super-only Ko’s. We saw in the e3 demo, that if you miss your super, you are screwed. And why didn’t you guys show off new characters in action? It’s e3! Not even a new stage or anything? Aside from the rediculous time spent on that book (you should have ending it after the applause after mentioning J.K.Rowling), this was the other mistake of your presser. If Drake and Big Daddy were playable on the show floor after the conference…….why didn’t you use the press conference itself to actually debut them in game? That was odd to me, that even though you had new characters at E3 to show off, you just showed the same exact thing you showed a month ago. Weird choice, but I guess sometimes it’s the obvious things we miss. Just made a PS.Blog.Share idea for Prinny in All- Stars! Please come vote it up! I also think that a Prinny would be a great character. I really hope this roster ends up being huge because there’s an absurd amount of characters they could choose from. freakin out about the Big Daddy. They need to add the traveler from Journey!!! Not in any particular order except my #1. Drake was expected, but Big Daddy? Wow, that’s certainly a surprise. Hope there’s a nice 30+ character roster in the game. LOOKING FORWARD TO A COLLECTORS EDITION AND IM ALL IN FOR A BETA TESTER SONY, GET @ ME. PLEASE MAKE A COLLECTORS AND ADD SONYS EX …CRASH BANDICOOT.AND PLEASE HAVE A FEATURE WHERE YOOU CAN RECORD GAMEPLAY AND SUBMIT TO YOUTUBE . LOOKIN FORWARD TO IT SONY! Also I’m not sure about the Vita version. I just don’t think I want to play this type of game on a small screen. I’m surprised not even a new stage was shown. Also, Big Daddy? Hardly a staple of the PlayStation, when i think of Bioshock & PS3, i think of a game the platform got later and was a pretty shoddy port. When can we expect more news about the game with a real, decent showing? Honestly, I expected Drake, but Big Daddy? Shocker! (No pun intended.) I still have my personal request of Vahn from Legend of Legaia, however. I would be so grateful if that were to happen! Game looks great so far. Keep up the great work, Superbot! They need to add at least a Hot Shot Golf character or a stage because the series is part of the Playstation history. NO LIKE THE ONLY KOs BY SUPERS!!!! NO GOOD NO GOOD!!!!! KNOCK OFF STAGE MODE with ACTUAL DAMAGE I DEMAND!!!! Also! dont put to much third party support! its good to put like a limit to 5! the rest must be ps exclusive. and not too many shooter guys! thats not good. 4: Demons Souls Knight ( He can use bow, sword and spells like soul Arrow and stuff and as special move FIRE STORM!!!) * DROOOLING! WAIT HE IS EXCLUSIVE! NEVER MIND! MAO(disgaea3) Tomba…. i cant remember anymore.. lol! Any bundle for both PS Vita and PS3 versions and what are their differences? Disappointed that their were some hints at Solid Snake but he didn’t show up in either a new MGS game or in PS All-stars..
Oh, neat, stupid Kratos is in it. Nice. Everyone was guessing Nathan Drake on the previous thread (Of course he’s going to be in it, just like Cole MacGrath), but I didn’t see anyone guessing Big Daddy. Heck, I had no idea who he was, but he does look like a nice addition to the roster. Still remember the original PSOne, though. Crash, Spyro, and Sir Daniel need to be in this. Along with them should be Nariko, Leonard, Sora, Ratchet & Clank (As one character), Jak & Daxter (Also as one character), the Journeyer, and various others. As for the Vita, will it be possible to play a battle with some players on the PS3 and some on the Vita using Remote Play? And will there maybe be special stages or even a character available only on one version? If so, could they still be played on either version through the remote play function? Also, it would be nice if there was a special “Variant Mode” on each character. Look at SSBB, see how you can click on your character’s portrait once selected to change the color? Something like that would be nice, except with only two versions (The PSASBR version would be default). For PSOne and PS2 characters, it could be the original polygon image (Like having KH2 Sora as default PSASBR, but his KH1 counterpart as a variant). However, something would need to be come up with for Variants for the newer characters. Some would be easy, such as Cole MacGrath. Make his default the hero (The default is hero in both games), and his Variant the evil version, with red electricity and paler skin. Sackboy could have a different costume. These Variants could merely help distinguish people playing as the same character more, and would only be aesthetic changes, making them relatively easy (I think). Overall, I was a little disappointed in the E3 Sony presentation. Not a whole lot of Vita stuff that we didn’t know about… Also, where’s the PS Plus support for the Vita? It’s great that there’s some big titles coming to the PS3, but why neglect the Vita? 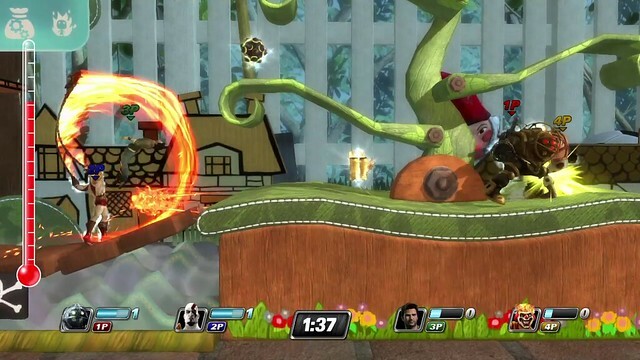 ALSO – Really let down that was no LBP Karting for Vita announcement!! This game would work perfect on Vita, why no port? Modnation for Vita was fun, but it had no on-line!! We need a Sony Kart Racer for Vita, Kart Racers are so much more accessible and fun on a portable! !